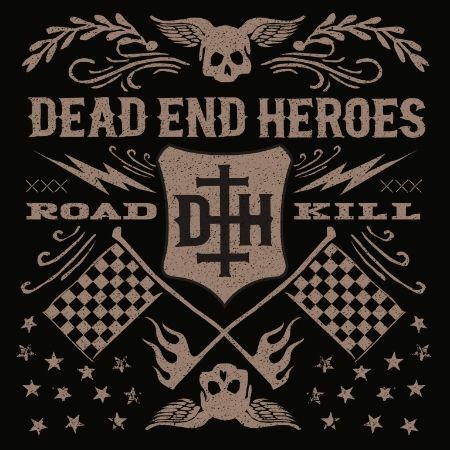 Earlier this month I posted a recommendation for “Roadkill” the excellent debut album by Dead End Heroes (http://www.rockradioni.co.uk/back-stage/music-reviews/1588-ni-rocks-recommends-qroadkillq-by-dead-end-heroes.html ). The band features Carsten ‘Lizard’ Schulz on vocals, Rolf Munkes on guitar, Daniel Voegeli on drums, Paul Logue (from Eden’s Curse) on bass and Holger Seeger on keyboards. Rolf Munkes also produced the album and he played a big role in the formation of the band. We contacted Rolf through M.E.P.R. to ask a few questions. NI ROCKS - Thanks, for taking some time to answer a few questions for Rock Radio NI. Dead End Heroes have just released their debut album “Roadkill” and we wanted to ask a few questions about the recording of that album, future plans and a few general things. Interestingly the album started off as a solo project from drummer Daniel Voegeli. Was it difficult to persuade him to take it forward as a band and how much does the finished product reflect that early work? Carsten “Lizard” Schultz, as you say, was then recruited to put lyrics to Voegeli’s tracks and perform the vocals. Had you worked together before and what made “Lizard” the right man for the job. Who took the lead on recruiting the final two band members Paul Logue and Holger Seeger? Had all the songs been written prior to the arrival of Paul and Holger or did they get to have an input as well? And how did you settle on the name “Dead End Heroes”? The album has a very classic rock vibe to it and the press release refers to Deep Purple, Krokus and Michael Schenker influences. How much of that reflects Daniel’s initial song writing or would that be more your influence? Do you have a favourite track (or two) from “Roadkill” and why? The first video from the album is for the title track. Was there general agreement on which track to record a video for and is that something you enjoy doing? We hear apparently that there has been a commitment to make Dead End Heroes more than just a studio band. Are there any tour dates planned and will the focus be on the European market rather than the UK initially? Are you hoping to get onto the festival circuit, and would there be any in particular that you would target? You work as a producer as well as being a guitarist. That must put you in a position to spot some upcoming talent. Are there any other bands you’ve worked with recently that you’d recommend to those reading this? A couple of quick questions just to finish with. Presuming you have an iPod or similar, if we pressed shuffle what 5 artists might we find? Can you remember the first album that you bought and the first band you saw in concert? Finally, what would you have hoped to achieve with Dead End Heroes by this time next year? Many thanks for taking the time to answer a few questions for Rock Radio NI. Best of luck with the album and hopefully we’ll see you out on tour sometime in the near future.